Diana's Designs: My First RAK! I just wanted to share with everyone this wonderful RAK that arrived in the mail today. 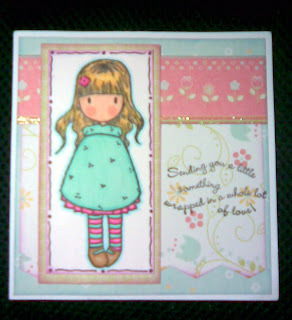 It's from a very talented cardmaker named Karen. I became an admirer of her work just after I first started making cards of my own back in January and I've been a follower ever since. I was never terribly interested in stamping but I couldn't resist after seeing what gorgeous stamps there are and I just fell in love with the Sugar Nellie Gorjuss stamps that Karen uses so creatively in a lot of her work. Sugar Nellie Stamps is a Scottish company and I haven't seen their stamps here in Canada, yet. 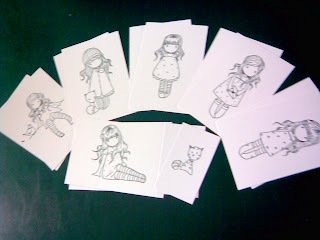 So Karen decided to mail some printed images for me to use and I cannot tell you how thrilled I am! What is so neat is that they arrived all the way from Scotland! And the best part of it all is the one-of-a-kind card Karen made for me. Isn't it just beautiful? Thank you, Karen, for your truly gracious and thoughtful gift! So glad that they have arrived safely and that you are happy with them. I hope you enjoy colouring them in. Thanks also for the thoughtful award that you have passed on to me. I am away with work for a couple of days, but will get it posted on my blog and passed on at the weekend. Right back at ya..will get it posted hopefully next Posting!! !